This trekking program around the base of Mount Cholomhari (7,316 m). This enchanting trek takes you to the base of Mount Jumolhari, one of the highest levels of Bhutan treks, the second highest unclimbed peak in the world. The mountain is revered by the local yak herders as the abode of their goddess. While trekking on part of his BBC Himalaya Adventure 2010, Michael Palin exclaimed, Farewell big, monumental, Himalayan peaks. Farewell Chomolhari. Chomolhari Trek beginning from Paro, the first three days of this trek follows the Paro Chhu valley to Jangothang base camp. 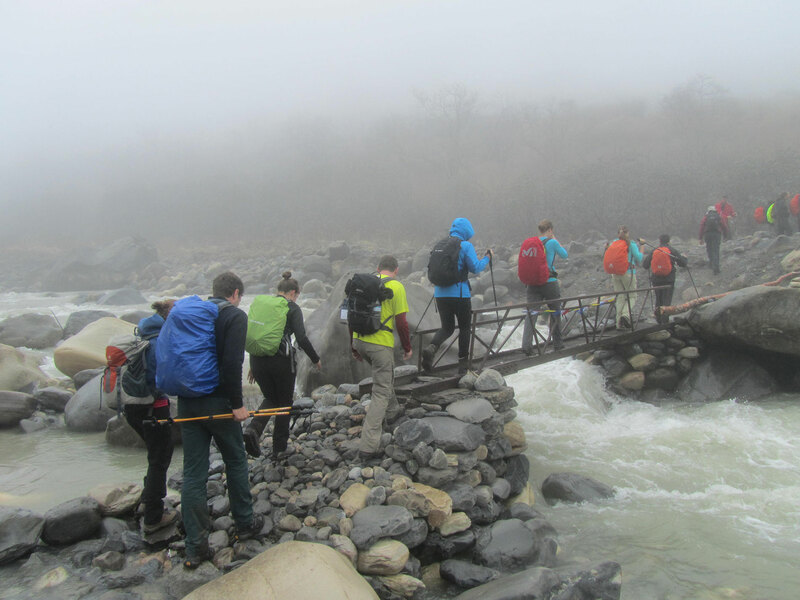 After an acclimatization hike to Tiger`s Nest Monastery, the trek starts from Drugyal Dzong. From there you will have a stunning view of 7513m Mount Jumolhari. The next day`s trail passes through high pastureland, and after crossing the highest point Nyile La Pass (4890m), you arrive at Lingshi which is the highest settlement in the north. En route relish the startling views of Jichu Drake (6989m) and Tshrim Khang (6789m). Lingshi Dzong perched on the 600ft hilltop offers commanding views of the valleys beneath. The Chomolhari trek also offers an opportunity to visit remote villages neighboring with Tibet and learn traditional lifestyles of nomadic yak-herders and highland farmers. Don`t forget to bring your camera to capture the sights of such highland animals as yaks, blue sheep, musk deer and elusive marmots. In the last few days, pass through conifer forests, canyons, and streams, and arrive at Dodena, where your car will be waiting to transfer you to Thimphu. The journey concludes with a cultural tour of Bhutanese Capital, the Thimphu Valley. The flight to Paro crosses the Himalayan Mountains, affording spectacular views of the awesome peaks, including the sacred Jumolhari and Jichu Drake peaks in Bhutan. On arrival at Paro airport, you will be met by our Bhutanese representative and transferred to your hotel after completion of arrival formalities, evening visit to Paro market and town. Morning visit to Ta Dzong, built in 1651 as a watchtower and in 1968 inaugurated as Bhutan’s National Museum. The collection includes art, relics, religious thangkha paintings, postage stamps, coins and handicrafts, as well as a small natural history collection. Below Ta Dzong is Rinpung Dzong (Paro Dzong), “the fortress of the heap of jewels”, built in 1646, and now housing the offices of the district administration and Paro’s monk body. In the afternoon, visit Kyichu Lhakhang. Built by the Tibetan king, Songtsen Gampo in the 7th century, it is one of the oldest and most sacred shrines of Bhutan. On a clear day you can see Mount Jumolhari, Bhutan’s second-highest mountain. The trek starts from Drukgyel Dzong (2,580m) with a short downhill walk on a wide trail. The trail then climbs gently through well maintained rice terraces and fields of millet. Later on we come to apple orchards and forests. Soon the valley widens, and we reach the army post of Gunitsawa (2,810m). This is the last stop before Tibet. We continue upwards to just beyond Sharma Zampa (2,870m), where there are several good camping places in meadows surrounded by trees. Acclimatization. Explore nearby mountains and lakes. The trail goes the stream for half an hour and crosses the bridge to the right bank. We now start our climb up to the first ridge, enjoying breathtaking views of Chomolhari, Jichu Drake and Tserimgang. The trail then takes us across a fairly level valley floor until the climb up to Nyele-la pass (4,700m). We descend gradually from the pass to our campsite at Lingshi (4,000m), enjoying a panoramic view of the mountain peaks and Lingshi Dzong as we walk. The Laya-Gasa route leaves the Chomolhari trek route here. Our trail climbs up towards a small white chorten on a ridge above the camp, then turns south up the deep Mo Chu valley. The trail stays on the west side of this largely treeless valley, climbing steadily a short distance above the Mo Chu. It then crosses the river, and climbs steeply for two hours to Yeli-la (4,820m). On a clear day you can see Chomolhari, Gangchenta, Tserimgang and Masagang from this pass. Descend alongside a stream to a rock shelter in the cliff face, and then continue on downstream till reaching Shodu (4,100m), where we will camp in a meadow with a chorten in it. The trail descends gently through a dense forest of rhododendron, birch and conifers, then drops steeply to meet the Thimphu Chu. The trail runs along the left bank of the river, climbing over ridges and descending into gullies where side streams run down into the river. The final stage of the trail climbs around a cliff face high above the Thimphu Chu, coming out onto pastureland where we camp for the night at 3,600m. The trail winds in and out of side valleys above the Thimphu Chu, making a long ascent through a forest of conifers and high altitude broadleaf species to a pass at 3,510m. The trail then drops steeply down to the river, following it southward to the road head at Dodena (2,600m). Etho Metho transport meets us here, and we drive to Thimphu. Full day of sightseeing in Thimphu valley visiting the following, as time permits: National Memorial Chorten; Tashichhodzong (“the fortress of the glorious religion”); National Library; Institute for Zorig Chusum (Bhutanese arts and crafts school); National Institute of Traditional Medicine (outside only); Handicrafts Emporium.Evening drive to Paro. Basically you can do some sightseeing in the morning and afternoon, you can enjoy shopping. Day 14: Departure from Paro.